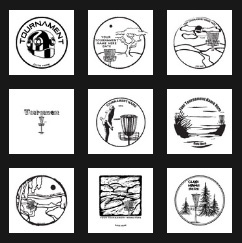 If you want a cool design for your club or tournament but don't have an artist to help you, simply choose one of these free designs and we'll customize it with your information! Select from either the hotstamp or color galleries. As you browse the images, make note of the design number you want (example: design # dgsc3017) and we will customize it with your club or tournament name and other important information. 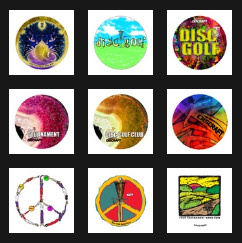 Because the Supercolor process covers virtually the entire top of the disc, Discraft reserves the right to include a Discraft logo and the name of the disc within your Supercolor template choice. Applies to all Supercolor orders that take advantage of Tournament and Club Specials.